ANC Education is EDEX Expo 2013 Platinum Sponsor for the third consecutive year! Here, meet YouTube’s most famo us Sri Lankan! Habitat loss is impacting severely on reptiles, both terrestrial and freshwater, in Sri Lanka and other tropical regions while nearly one in five reptilian species in the world is threatened with extinction, an important study has found. 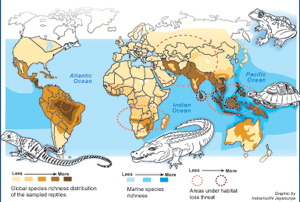 This first-ever global analysis of the extinction risk in reptiles, published in Elsevier, a leading international science and health information magazine, also highlights knowledge gaps and conservation priorities. For freshwater and marine reptiles, biological resource use has been identified as the “most significant” threat while agriculture and aquaculture, urban development and pollution also affected them.The study on the ‘Conservation status of the world’s reptiles’ which is based on a random representative sample of 1,500 species – 16% of all currently known species — will help ensure the continued survival of the world’s reptiles, the Sunday Times understands. Pointing out on a positive note that none of the species in the sample was classed as ‘Extinct’ or ‘Extinct in the Wild’, although three lizard species (Anolis roosevelti, Ameiva vittata and Stenocercus haenschi) in the ‘Critically Endangered’ category were flagged as possibly extinct, the study states that it may be up-listed during future reassessments. The other findings of the study were that more than half of the reptilian species (59%) were of ‘Least Concern’ while 21% were ‘Data Deficient’. Six species previously falling under ‘Not Evaluated’ of the IUCN Red List have now been assigned categories. The study stresses that it is “a shortcut for deriving group patterns on which to base sound global conservation action” to fill the geographical gaps in the current assessment process of the IUCN particularly in Africa, Latin America, Asia and Australia. Producing the first global-species and threatened species-richness maps for reptiles, the study is quick to point out that reptiles are currently poorly-represented on the IUCN Red List of Threatened Species. The study sample which reflected reptilian diversity consisted of 58% lizards, 37% snakes, 3% turtles/tortoises, 2% amphisbaenians (worm lizards) and 1% crocodiles sans tuataras. Reptiles coming down from more than 250 million years including the Triassic and Jurassic periods have adapted to almost every temperate, tropical and desert environment and to terrestrial, freshwater and marine habitats, according to the study and play important roles in natural systems. They are “predators, prey, grazers, seed dispersers and commensal (living with, on or in another without injury to either) species; they serve as bio-indicators for environmental health, and their often specific microhabitat associations provide the ideal study system to illustrate the biological and evolutionary processes underlying speciation”. Delving into the study, Sri Lanka’s reptile expert Anslem de Silva, points out that the proportion of threatened reptile species is highest in freshwater environments, tropical regions and on oceanic islands, while data deficiency was highest in tropical areas, such as Central Africa and Southeast Asia, and among fossorial (burrowing or digging) reptiles. This is why we are reiterating the need for research to be carried out in tropical areas, he said. On a positive note, Mr. de Silva said that “overall species richness” in the study sample was highest in tropical regions including Sri Lanka, Southern India and throughout Southeast Asia, from Eastern India to Indonesia and the Philippines; Central America and parts of northern South America, tropical West Africa and parts of Southeast Africa. But, the tropics also harboured the highest proportions of Threatened and Data Deficient species in the sample. In a hands-up from Sri Lanka for reptiles, the country will host the world’s biggest crocodile conference – the 22nd Working Meeting of the Crocodile Specialist Group of the IUCN/SSC from May 20-23, under the direction of Mr. de Silva. An extensive training on the veterinary aspects of crocodilians will also be held by four leading veterinarians of the world on May 19 at the Dehiwela Zoological Gardens. ‘Threatened’ reptiles worldwide have been estimated to be 19% and ‘Near Threatened’ as 7%. �The ‘Near Threatened’ group has been identified by the study as the “most likely candidates to become ‘Threatened’ in the future, if measures are not taken to eliminate anthropogenic processes which currently affect populations of these species”. Of the 223 reptilian species classed as ‘Threatened’, around half (47%) have been placed in the ‘Vulnerable’ category; 41% assessed as ‘Endangered’ and 12% as ‘Critically Endangered’.